Seniors are among one of the largest existing and largest growing demographics of medical cannabis users , evidenced by international trends as well as is supported by the data collected from the Strainprint app. A report released late 2017 by Statistics Canada, indicated that older generations are the demographics consuming larger amounts of cannabis within the new age of legalization. This is a strong indicator that cannabis education, and cannabis culture should be targeting seniors, as we face one of the largest demographic shifts the world has seen with its aging Baby Boomers. At Strainprint we are always curious about learning more about our users; especially when we identify trends in our data. We were interested in answering the following questions: What are seniors using cannabis for? How are they consuming? Here’s an overview of medical cannabis use in seniors, with a future focus on the emerging needs of seniors amidst a significant demographic shift. 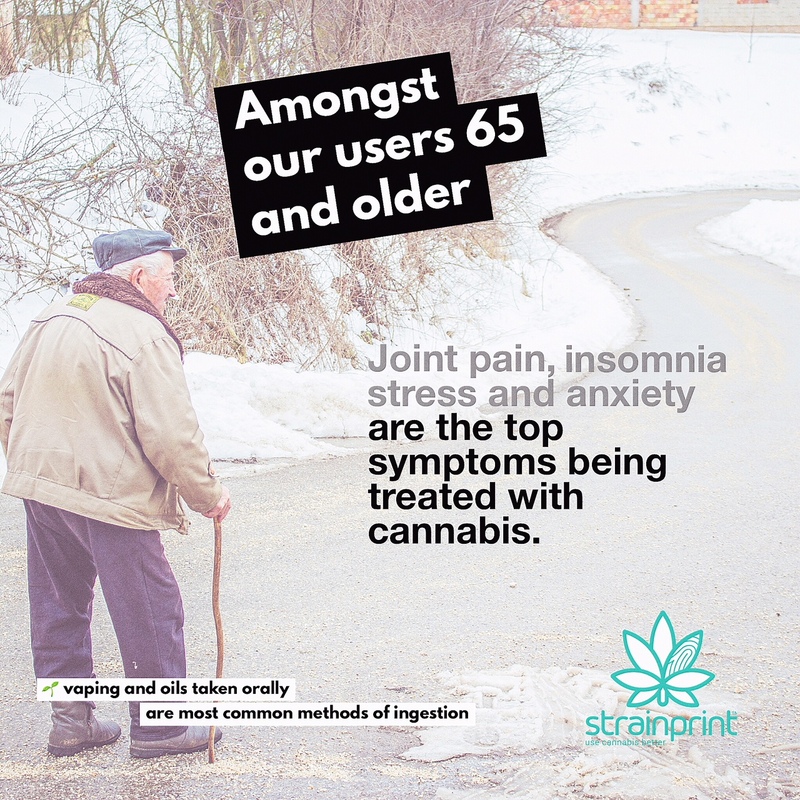 The data collected by Strainprint on patients 65 years and older revealed that they were using cannabis for 5 common symptoms. Pain is our body’s response to inflammation and why people turn to prescriptions to manage the physical and emotional difficulty pain presents. For many, joint pain is the most described type of pain for medical cannabis users. Common joint pain conditions include arthritis, fibromyalgia, joint pain, injuries, and cancer and cancer treatment-related pain. Adding cannabis to the body’s already existing endocannabinoid system delivers a dose of cannabidiol (CBD) to the brain which works to interrupt the pain signals to the brain, bringing alternative pain relief through the natural analgesic effects cannabis is lauded for. Statistics Canada in 2013 showed that two-thirds of medicinal marijuana users were registering for support for arthritis, which is considered a common later-life onset pain-related disease. Insomnia and the inability to get a restful sleep is a common complaint amongst seniors. It’s often misconceived that you need less sleep as you age, but as you do get into older years, sleep is an important part of maintaining good physical and mental function and health. As people age, however, it’s commonly reported that many people aren’t able to fall asleep quickly, and stay asleep as they get older. Some of these causes include poor lifestyle habits including alcohol consumption before bed, napping during the day, or not getting enough physical activity. Cannabis, especially Indica strains, can help people fall asleep faster, and maintain a restful sleep pattern. Those who promote cannabis for insomnia draw upon the way cannabis can also complement other national sleep aids due to the terpenoids present in each and what’s known as The Entourage Effect. Cannabis is also being explored amongst the medical community as a treatment of symptoms of sleep apnea, recognizing that cannabis has a way of inducing restful and relaxed effects on the body, and breathing, when used in proper doses. The life’s transitions in older age are incredibly stressful and can be traumatic for many as they face many decisions about their future. People in their golden years should be able to enjoy these years stress-free. For many, life’s transitions as we age, lead to a high level of stress and social anxiety, resulting in a desire to be reclusive or withdrawn to avoid stressful situations. A review of our data revealed many seniors are turning to their vaporizers to reduce stress and finding new ways to manage these transitions that make them more comfortable socializing. Common strains like Green Crack and Pineapple Express are both sativa dominant strains that boast an energetic and uplifting high, that can be micro dosed for maximum effect without a strong high. When used in small doses through effective microdosing, it may help people move past their own perceived barriers, which is important when trying new things and taking on new social activities that help reduce stress. The medical cannabis community has embraced CBD rich strains for its effects in boosting mood and increasing the way the brain receives serotonin through its serotonin receptors. CBD has been important in the discussion on medical cannabis for depression and anxiety. CBD is being celebrated for its neuro-protective and neuro-regenerative properties, and is being embraced by many for its ability to heal the brain per se. The cannabis community and many groups such as Veterans are advocating for CBD access as an effective method to treat the symptoms of Post Traumatic Stress Disorder (PTSD), which can be helpful for older adults facing certain traumas through losses or life transitions. Strainprint was interested in learning more about cannabis consumption amongst seniors. A data pull from the Strainprint database for this demographic revealed some very interesting trends for how seniors are using cannabis. We looked at a sample of Strainprint users 65 years and older and discovered that seniors prefer vaping their cannabis, with the overwhelming majority choosing this method. Using oils (edibles, topically) was a close second. What we found interesting is that although vaping is most popular, there are more sessions reported among users of oils, showing more frequency of use for this ingestion method. Smoking cannabis is reported as the third most popular, but with a rather low occurrence of sessions/frequency. Tinctures with frequent use are next, while concentrates fall significantly behind for use among seniors in comparison to more convenient methods. These statistics are important for clinicians, Licensed Providers, and medical cannabis users to understand insights into methods of use, dosing and effectiveness for treatment of medical conditions. The prevalence of use for common conditions in seniors shows that there is a need to provide this demographic with targeted outreach and education on medical cannabis. Cannabis dispensaries like Farmacy in Victoria, BC, revealed that over 50% of their customers are baby boomers. This could very well be due to the retro, classic rock design and culture of the dispensary and its focus on cannabis education for seniors, but either way, seniors are flocking to medical marijuana. Canada’s big cannabis corporations like Canopy Growth Corporation have been making efforts to speak to retiree groups, as evidenced by a recent speaking event. Cannabis companies are ‘getting real about seniors’ role in cannabis. Doctors in places like Sarnia, Ontario are embracing medical cannabis as a therapeutic option for many patients, particularly the elderly. The great thing is that more people are emerging to meet the needs of North America’s senior citizens with medical cannabis. As demographics shift in a very real way for our nations with Baby Boomers aging significantly over the next few years, medical cannabis may be getting a new face. When we recognize the uses for cannabis in those over 65, we see the need for a multi-generational approach within the cannabis community. Dispensaries, Licensed Producers, and cannabis communities need to expand their sales strategies, cannabis education, and engagement to ensure that patients are being heard, understood and are able to maximize the privilege that being a legal medicinal cannabis patient affords.